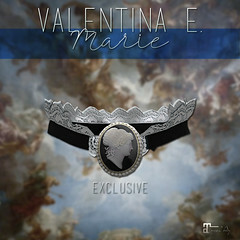 May 2018 – Valentina E.
NEW! Valentina E. May Gown & Dress @ UBER! Out now at Uber the new Valentina E. May Dress & Gown! These pieces are inspired by Givenchy’s Wedding gown for the recent royal wedding. Wear yours for any occasion as they can both be dressed up or down. Find both in five color options exclusively for Maitreya Lara. NEW! Valentina E. Miriam Ensemble @ Pocket Gacha! Out now for the May round of Pocket Gacha the new Valentina E. Miriam Ensemble! Inspired by Dior’s equestrian designs, this gorgeous set is both classic and edgy. Exclusively for Maitreya Lara. Don’t miss it! NEW! Valentina E. Dahlia Latex Dress @ Romp! Out now at the latest round of ROMP our new Valentina E. Latex Dress! Find it in four color options for Slink, Belleza, and Maitreya mesh bodies. Demo available at our main location and at the event. NEW! Valentina E. Yes Miss Ensemble For Bound Box! NEW! Valentina E. Rosie Dress DUO @ The Chapter Four! Out now at The Chapter Four our new Rosie Dress Duos! Solid color and print versions included for the price of one with four color options, exclusively for Maitreya Lara. Demos available at the event and at our Main Location. NEW! 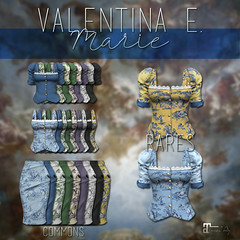 Valentina E. Alora Dress @ FaMESHed! NEW! Valentina E. Iona Dress @ The Gacha Garden! Out now at The Gacha Garden the new Valentina E. Iona Gacha! Earn our ‘seeds of inspiration’ item with points! Info at the event inworld.